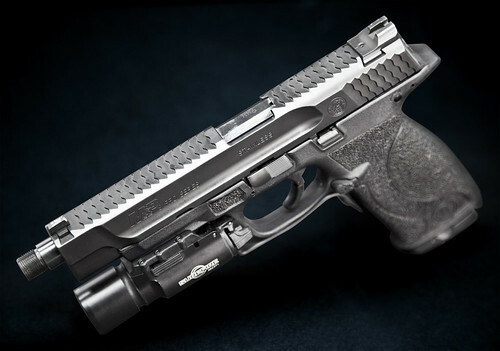 A few pictures of the new GBB from WE, the M&P 40 will be commercialized under the name Military & Law Enforcement (M&LE). Two versions will be available: normal and compact. Removable back straps (bk, tan and pink so far). The normal version will come in two colors: Black and Tan. Hopefully they'll add something resembling slide markings before it goes into full production but this is exciting! If it's consistent with WE's recent quality- I think we'll be seeing a nice supplant for the not-coming-until-2021-TM M&P. Or if WE doesn't release any version with markings I guess HK3P will. Sure its based off the .40 version? I swear it says 9mm on the barrel in the pictures in the above link Renagadecow posted. I was just about to say. But then again a more suitable officially labeled thread might not be all that bad. Or perhaps a rename of the existing thread is in order. The real M&P 9 & 40 are identical externally. The .45 is the only caliber with front slide serrations. Also apparently, the production guns DO have 9mm marking on the barrel.